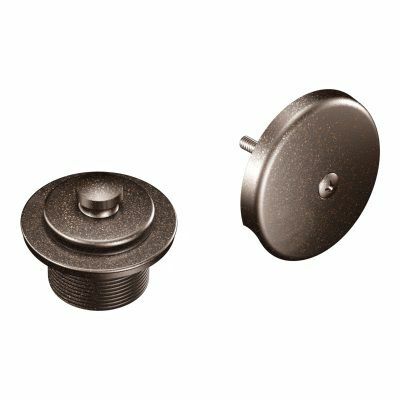 Push-N-Lock Tub Drain Kit With 1-1/2 inch Threads in Oil Rubbed Bronze From finishes that are guaranteed to last a lifetime, to faucets that perfectly balance your water pressure, Moen sets the standard for exceptional beauty and reliable, innovative design. Push-N-Lock Tub Drain Kit With 1-1/2 inch Threads in Oil Rubbed Bronze is rated 4.2 out of 5 by 31. Rated 5 out of 5 by Aileen from Easy to install. Color of finish was perfect. ... Easy to install. Color of finish was perfect. Rated 3 out of 5 by noname from The drain and overflow cover look nice. Wish the overflow... The drain and overflow cover look nice. Wish the overflow would have come with an adapter for 2 to 1 screw. Instead moen sells this as a separate part. Otherwise the parts look good and match the moen bath faucet. Rated 5 out of 5 by Kat49 from Hall bath is not yet back in service, awaiting the completion of the makeover. However, when the ... Hall bath is not yet back in service, awaiting the completion of the makeover. However, when the plumber came in to examine the bathtub plumbing, he indicated that the drains were in good condition and installed these two items. It is amazing how just a small piece of the "puzzle" can brighten up an unfinished project. Rated 4 out of 5 by HomeDepotCustomer from Looks great and easy to install.... Looks great and easy to install. Rated 5 out of 5 by Inspectorb3 from We had just completed a bathroom remodel which included a new bathtub. We used the Moen tub and ... We had just completed a bathroom remodel which included a new bathtub. We used the Moen tub and shower drain covers in Oil Rubbed Bronze to complete the system. The items matched up perfectly to the Moen shower system pieces we bought. We do wish the drain cover lifted a smidge bit more to allow for faster drainage but it works well and can possibly be adjusted and we just have not done that yet. Rated 5 out of 5 by Wendell from It fit perfectly and looks good. ... It fit perfectly and looks good.